TOKYO--(BUSINESS WIRE)--Komamura Corporation is happy to announce that it launches the new KC-2000MKII as the upgraded model of the current KC-2000 ultra-high sensitivity color night vision camera, featuring a switchable capability to infrared with a touch of lever at any time to capture subject under extreme dim-lit conditions in video or still image. 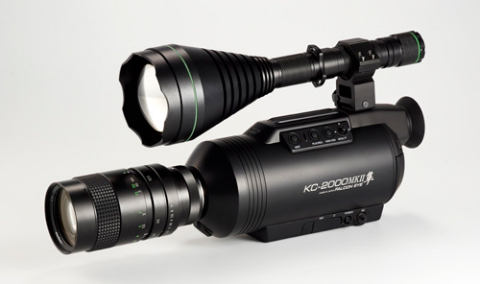 The new KC-2000MKII works as a “two-in-one” night vision camera with hand held convenience either in color or infrared modes whenever you need to switch either way. The new Falcon Eye KC-2000MKII will be unveiled at the IFSEC Expo in London during June 20th-22nd at Booth C320. It captures High Definition images in color in extremely dim-lit conditions, down to 0.005 lx during day-and-night, with auto gain control system. It allows IR (infrared) image capturing in total darkness with using IR illuminator. One unit covers all conditions (night and day, in all lighting conditions, in color or IR (infrared), in video and still images. It uses a world-standard battery (7.4V, allowing continuous shooting for about 4.5h). Lightweight (about 1.1kg), compact and handy (measuring 108 x 100.1 x 210.5mm,, excluding the lens). Komamura Corporation was established in 1947 and has been an important player in the international professional camera business for more than 60 years. Komamura Corporation developed and marketed the Horseman Professional Camera product range for large format film, and later developed new models for digital photography. Komamura launches KC-2000MKII, ultra-high sensitivity color night vision camera with a switchable IR mode.